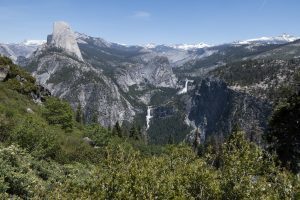 From the scenic Glacier Point you will drop down past expansive views and three incredible waterfalls to the Yosemite Valley floor. After exploring the popular and busy Glacier Point and its incredible views, find the signed Panorama Trail to the southeast. You’ll travel through tall trees scattered over manzanita. Half Dome remains visible while Nevada Fall and Vernal Fall crash below, all backdropped by the summits of the High Sierra. As you continue traversing Illilouette Ridge, Illilouette Fall comes into view as well as the rest of the Panorama Trail that climbs over Panorama Cliff. The trail drops down through the shrubs past a trail junction to switchback down to the precipitous top of Illilouette Fall which drops 370ft/113m. The trail crosses over Illilouette Creek and climbs up above Panorama Cliff where new views of Yosemite Valley await. The trail switchbacks down through the forest to the John Muir Trail (JMT). While the quickest way back to the trailhead is down the JMT (saving only 0.5mi/0.8km), take a right to the top of Nevada Fall. Follow the trail over the bridge and take a left down the Mist Trail to travel down alongside the waterfall and over to the top of Vernal Fall. This steep trail is made of stone steps which receive spray from the waterfall, so be careful. 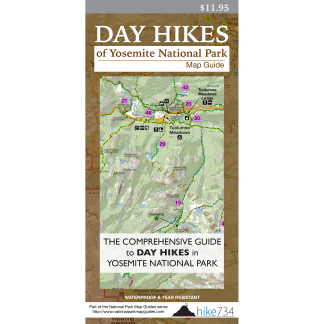 This joins back up with the JMT and out to the trailhead. A longer, 13.9mi/22.4km alternative involves hiking up the Four Mile Trail and down via the Panorama Trail (see Four Mile and Panorama). Trailhead: Take the fee-based hiker’s shuttle up to Glacier Point (or arrange your own shuttle).